The majority of studies investigating the cognitive effects of modafinil, a wake-promoting compound, demonstrate some improvements in attention. 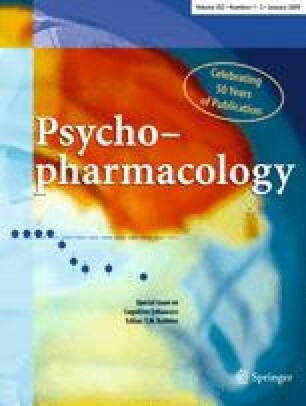 The potential of the drug to selectively benefit distinct components of attention has yet to be fully explored in healthy adults. The present study was conducted to investigate modafinil’s effect on specific cognitive tasks that tax components of attention switching. One required the rapid switching of attention between stimuli, and another contained an embedded working memory component on top of the attentional shift requirements. Additionally, prospective memory was examined, which requires the interruption of an ongoing activity to retrieve and act upon a previously formed intention. Healthy non-smoking volunteers, matched on age, intelligence, and baseline cognitive ability, received either a capsule that contained 200 mg modafinil or placebo. Subjective measures of mood and physiological response were taken throughout the experimental session, and the tasks were completed between 2 and 3 h post-dosing. Two hundred milligrams modafinil improved accuracy without a reaction time trade-off, in both conditions of the attention-shifting task, but only when resources were most challenged. In contrast, the drug afforded no improvement in prospective remembering or in the ongoing task that was interrupted. Modafinil appears to promote rapid switching of attention in conditions that are most demanding, whilst it offers no benefits in a task that requires unpredictable and infrequent disengagement of attention from an ongoing task in order to act upon an alternative task. This work was supported by a Sussex University D.Phil. studentship and an Overseas Research Scheme Award to the first author. We would like to thank Sam Hutton and two anonymous reviewers for the helpful advice.